How we spent our New Years! We had a nice weekend, though a bit cool for long walks. 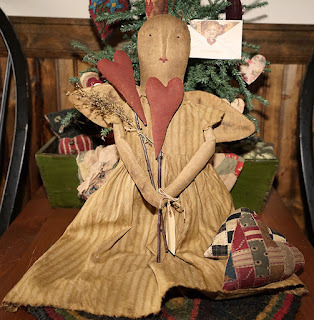 One thing I love to do is shop at the antique thrifts and Saturday was a good day for the barn and a visit to Chepatchet which has several antique stores and a primitive store. With all that shopping, I didn't get much, but I treated myself to an angel valentine doll. This one hangs on the wall, but I put her on the table for the photo. She looks good, either way so once I get more decorating and cleaning done, I may give her a space of her own. For now we are keeping the main wall free of decorations so maybe, just maybe my husband will clean it up and get it repainted so I can put up my easter decorations. I also found a plain wooden boat for a dollar, I will sand all the varnish off and remake it into something for my beach room, maybe add some fabric sails. When we were in town, I saw a step falls but it was impossible to get a photo from the right angle, too much brush and slopes. I did see a small falls on the other side and I loved how the water at the top was smooth as glass but whorling so that the shadows looked like an art painting. On Sunday we got a late start and headed to Woodstock Ct, for some more shopping and to visit Putnam for some photos. 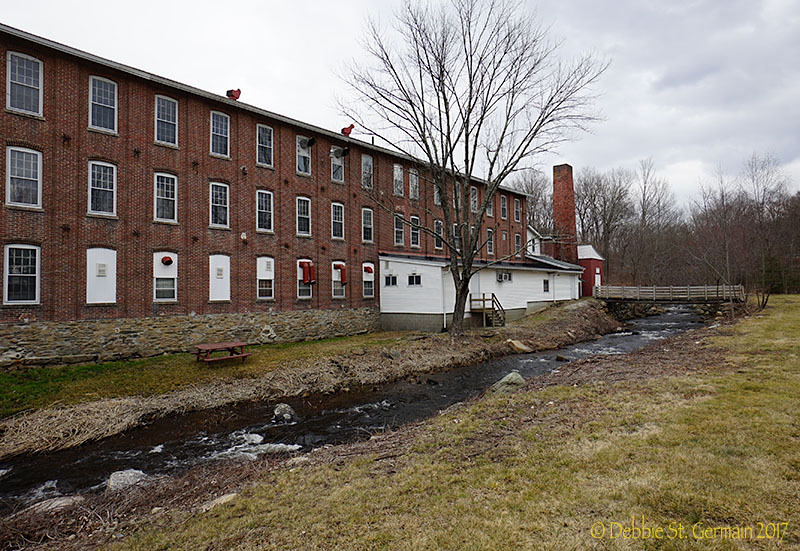 We always try and take a different route to find new sights and on this trip we stopped at a mill. It looks like this one is still operational. 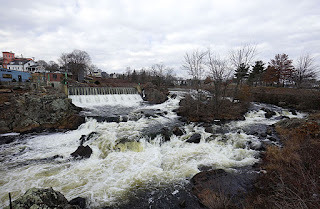 In Putnam we found a parking lot across from the falls, so we took a walk over and I enjoyed watching the falls. With the snow and then rain, they were running, full force. It was too cold for me, to take a walk along the river, so we went back across the street to check out an antique store. Well, it was not a store, it was an antique mall, four floors of booths and in areas, whole rooms with glass cabinets, filled with goodies. It was so overwhelming, I don't think I saw half of the things, lol. And so big, we spent hours just walking and looking. I saw a lot of nice things, but prices that seemed to be inflated compared to what I have bought. 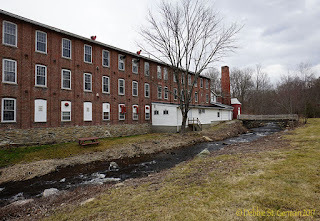 It is well worth a visit if you are in the Putnam area, they do have a lot and there are other stores in the area, as well as small shops and restaurants. Since we spent so long in the store, I decided that I wasn't up to going up to Woodstock and doing more shoppng. 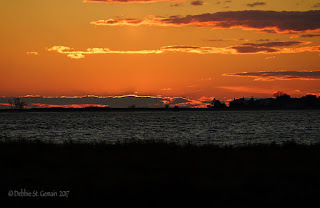 But, I did realize that we were were about an hour away from sunset and if we headed back down to the ocean, we could just make it, lol, yes, we drove an hour back down and went to Barn Island, since it was the straightest point from where we were. It was a beautiful place to enjoy the sunset, but no place to stand, so we had to go out on the marshy point and walk carefully along the thick tufts to stay out of the muck. 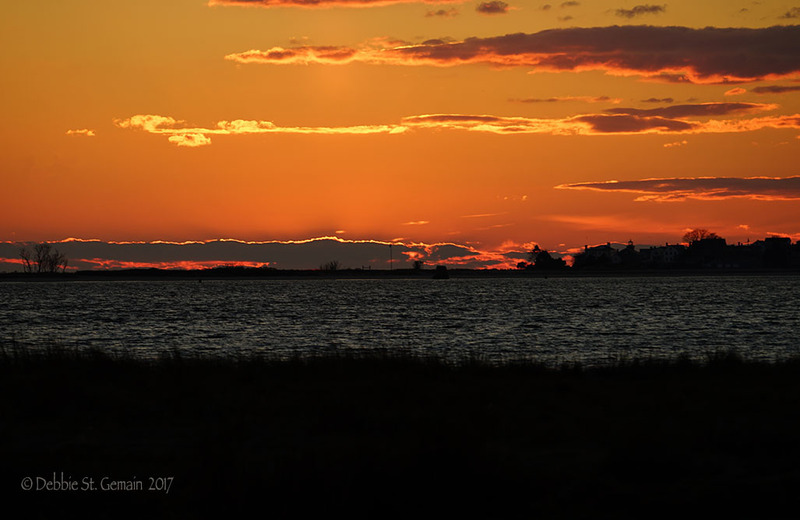 The sunset is always the most stunning when it falls below the horizon and a beautiful way to end the day. I hope you all had a wonderful weekend, filled with your own adventures. A lovely post, you find such interesting places to go! I love your doll, how sweet! The falls look cold, and s bit dangerous. That is a huge building! You do find some awesome places to visit. Beautiful pictures! Like your Valentine Angel and what a beautiful sunset! you must have a shopping angel because you always find the neatest stuff...and the photos...are gorgeous! Debbie, she is the sweetest angel. Love that sunset photo. A sweet prim style Valentine angel. Did the hearts laying on her skirt come with it or did you add those yourself? I would be hard pressed not to have that doll come home with me also, she is adorable. Lovely vignette you set up for her. Your sunset photo and other shots are lovely. Interesting colour to the sky! 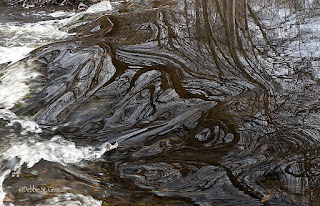 I love that swirling water. What a piece of art!